First rule during a dog fight: keep your hands to yourself. Or if you're going to put your hands in the way, make sure they're nowhere near teeth. You will get hurt. 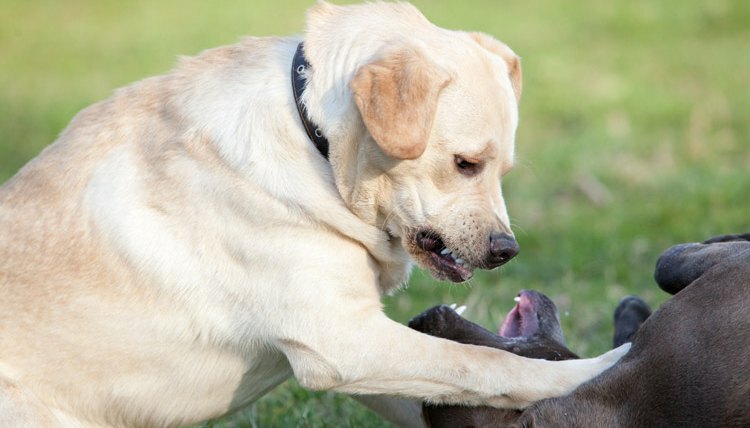 Breaking up a dog fight can be difficult and dangerous, but never impossible. Here are four methods that will allow you to stop the fight without having to get in the middle of it. Lift From Behind - Get behind your own dog, grab him by the legs and lift and twist. This will make the dog fall on his back. Only do this if another person is doing the same to the other dog involved in the fight. Otherwise, all you're doing is exposing your dog's neck and chest to the other dog, and this could lead to a lot of damage and pain. Don't try this with dogs you don't know. Also, don't remain still in one position once the dog is on his back. Move and slide your dog slowly -- and gently -- on the ground until he calms down or until the other dog is out of reach. Sour Spray - Fill a bottle with vinegar and spread it near the dogs' faces. Not on the face, where it can burn the eyes -- unless you think the fight is about to get your dog killed, in which case, spray the other dog directly on the eyes. The strong smell should be enough to distract the dogs momentarily so you can grab yours. Again, somebody else needs to grab the other one, or you're just making the attack easier for the other dog. Carry the bottle with you when you go out or around the house if the fights happen right at home. Blast of Water - Try a water hose in full blast if nothing else is available. Aim it directly at the dogs' faces. Water in the ears and eyes is very annoying, so aim for those areas. This might not work with breeds that bite and lock their jaws into the bite --such as pit bulls -- but if you have no other option, it's worth a try. Extinguish the Aggression - Use a fire extinguisher if you have one handy. Aim it at their faces and go at it full blast. The mix of air burst, wetness and lack of visibility will distract the dogs enough for you to grab your own dog and take off as fast as possible. WARNING: Don't scream or panic. It only adds to the chaos of the situation and it can make things even worse.